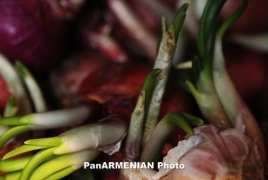 PanARMENIAN.Net - Aside from their ability to inject deep flavor into almost any meal, onions and garlic might also protect against cancer, Medical News Today reports citing a recent study. Garlic, onions, leeks, chives, and shallots are classed as allium vegetables. They are grown throughout much of the world and form the bedrock of family meals far and wide. Earlier studies have shown that certain compounds in allium vegetables — including flavanols and organosulfur compounds — are bioactive. Some have been shown to hinder the development of cancer. Scientists from the First Hospital of China Medical University recently set out to understand whether consuming greater amounts of these vegetables might prevent people from developing colorectal cancer. They recently published their results in the Asia-Pacific Journal of Clinical Oncology. Not counting skin cancers, colorectal cancer, also called bowel cancer, is the third most common cancer diagnosed in men and women in the United States. Researchers are aware of certain dietary risk factors, such as consuming high levels of red or processed meats. However, they know less about foods that might protect against bowel cancer.